Currently, various technology trends are disrupting the mobility ecosystem in many ways. It could probably unravel beyond what many technology experts in mobility foresee. This turbulent flow will cut across manufacturers, auto retailers, insurance sectors, financial institutions and go up to regulators. In many ways, this will induce organizations that have vested interests in the transportation sector to evolve their business and operational model to stay ahead of the game and remain competitive as the future for mobility unfolds (Deloitte). Information technology will be a key driver of innovation in mobility, allowing smarter and more flexible solutions. As projected, there will be 34 billion devices connected to the internet by 2020, up from 10 billion in 2015 (Business Insider). 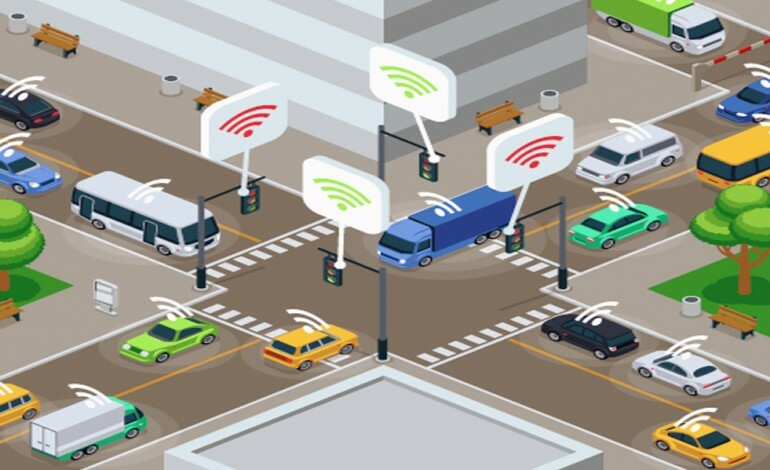 As such, the mobility sector will grow more prominent with recent Industry 4.0 development gaining traction alongside other smart city initiatives. 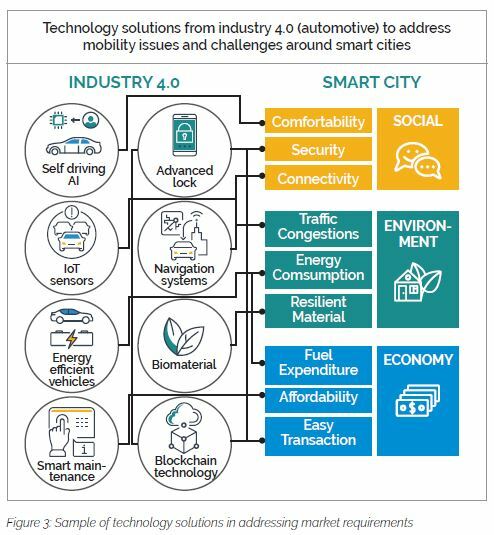 Therefore, this article aims to further the discussion on Industry 4.0 and smart city integration from the context of mobility and how positive Industry 4.0 development can be leveraged for smart city initiatives. Industry 4.0 refers to smart manufacturing activities or better known as the place where new products and technologies are manufactured. Meanwhile, smart city is a platform where these products and technologies get deployed. To delve deeper, the authors would like to refer to cases that are based on the example Malaysia’s automotive industry in respect of the aforementioned trends. 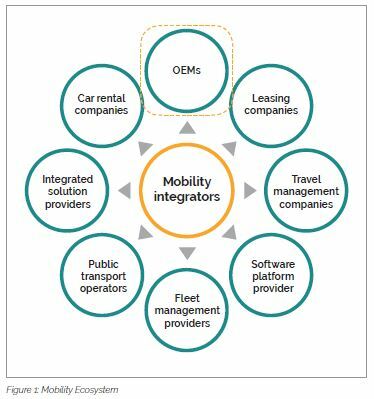 Figure 1 shows the overall mobility ecosystem and the cluster involved. 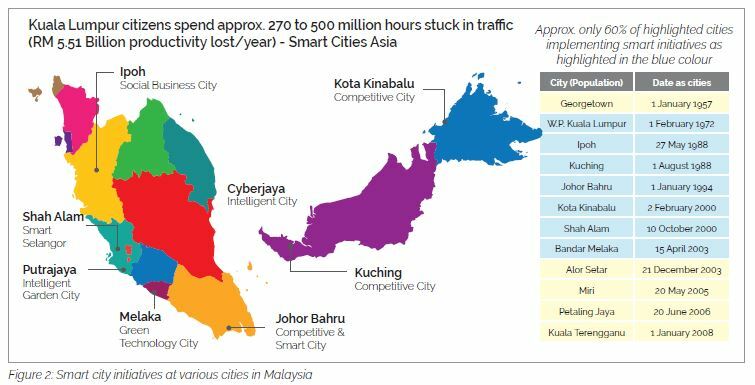 According to the statistics, 75% of Malaysian live in urban areas and the country’s urbanization rate goes about 4% a year on average—amongst the fastest in East Asia (Urbanice Malaysia & World Bank). This indicates that mobility is highly intense at city level compared to rural areas. Whereas, Figure 2 shows the local landscape with regard to smart city implementation that encompasses various focus areas such as water, waste, energy and mobility. The transportation sector in Malaysia consumes 35% of total energy and produces nearly 50 million metric tons (Mt) of CO2 in 2015. This contributed toward pollution and the environmental challenges that the country is facing (Malaysia Stocktaking Report on Sustainable Transport and Climate Change, GIZ) as 85.2% of the transportation emission source is from road transport. In the Malacca State Greenhouse Gas Emission Inventory Report 2013 prepared by Malacca Green Technology Corporation (MGTC) & ICLEI Local Governments for Sustainability; it indicated that on-road petrol car had the highest share of GHG Emission in the city which stood at 58.7%. At the city level, there were a number of issues and challenges highlighted and these issues were closely related to mobility such as traffic congestion, safety, security, limited parking space, navigation and comfort ability. Understanding the issues and challenges at hand, the technologies forcing to go mainstream seek to address current industry constraints. Driven by nascent market needs and incoming trends, new technological solutions identified will lead to an unprecedented transformation of the mobility ecosystem. Subsequently, this will provide answers for the conundrum regarding why car manufacturers produce their cars equipped with the latest sophisticated technology features. It is done to fulfill specific objectives to resolve future market needs as well as to live up to consumer expectations. Figure 3 shows samples of how cars sporting the latest technology features provide solutions for the issues faced by consumers and describes an accurate equation between a technology push and market pull. Therefore, we can see how the linkages between Industry 4.0 manufacturing and smart city interact. At ground level, the application platform concentrates on how car users experience and benefit from smart city features. Despite a low portion of car usage in rural areas, geographically, it represents a different set of challenges and mobility requirements. Therefore, car automakers must embrace Industry 4.0 in smart manufacturing to produce products that the evolving market wants. In addition, car manufacturers need to factor in usability considerations and equip their cars with features that offer flexibility for areas that lack smart facilities. This makes Industry 4.0 an access gate for manufacturers to streamline their production line facilities and operations with state-of-the-art technologies (Flexis). Although not every manufacturer has the luxury of a complete facility with Industry 4.0 features, on average, most manufacturers have already embraced the basic principles of Industry 4.0. According to Bosch, with the adoption of smart and connected lines, the company recorded a 25% increase in output for its automatic braking system (ABS) and electronic stability programs. Moreover, smart city implementation will further push digitization and deployment of new technologies in the mobility sector. Currently, there are a host of Industry 4.0 technologies advancing the manufacturing sector namely 3D Printing, Artificial Intelligence, Robotics & Automation & Virtual Reality. Some of the technologies being developed for smart city applications include big data and cloud storage. 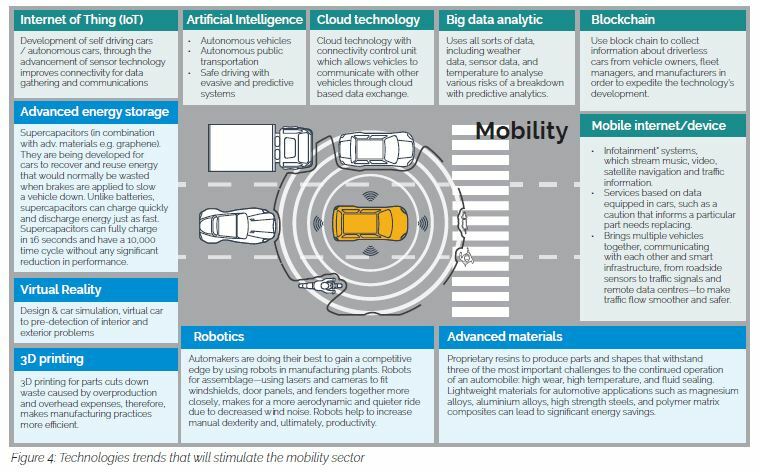 Saliently, this will complement technology development in the mobility sector as described in Figure 4. Finally, this article aims to form a view of the interrelation between a technology push and market demand by studying a few key examples of Industry 4.0 and smart city applications from the aspect of mobility. Besides, there are plenty of Industry 4.0 opportunities from other sectors that can be link to smart city application spanning ICT, waste, water and energy etc. However, as technology transforms mobility, the factors that we should collectively consider require a holistic examination to tailor suitable solutions in diverse crosscut sectors.